Over 40% of travelers used smartphones (websites and apps) to shop, up from 28% the year before. 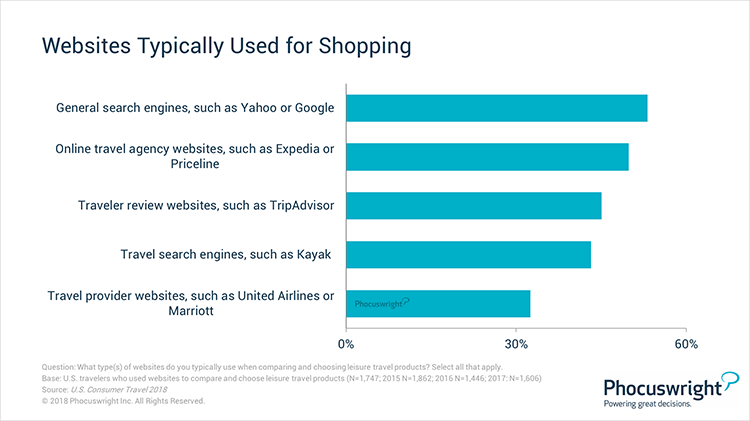 A further analysis of websites/apps used in the shopping phase revealed how different ages play a role in determining which websites travelers are most likely to shop on (general search engines vs. supplier websites vs. OTAs). OTAs and suppliers, the two primary online channels, have long battled one another for travel bookings. In 2017, however, metasearch was the real winner. The most dramatic shift to metasearch happened among lodging bookings. Offering better prices is the top reason that travelers book online; getting better prices is why more than four in 10 recent hotel loyalty members joined their program. Part of the U.S. Consumer Travel 2018 series, this report explores the key trends in travel shopping and booking, including online vs. offline channels, websites used, the impact of loyalty program memberships and more. Subscribe to Phocuswright's Open Access to access each report from this series, and discover the industry's most comprehensive research library. Not a subscriber? Learn how to get company-wide access to the full Phocuswright library here.